Speaking out for the first time after he was acquitted in a federal investigation, George Zimmerman cast himself as an innocent American persecuted by the federal government and the president personally, after he shot and killed a black teenager in 2012. What should have been a “clear-cut self-defense matter” turned into a federal persecution of him as a white racist, Zimmerman said in a 13-minute video interview to his lawyer, Howard Iken, which was released on Monday. Asserting his treatment by the government was unfair, Zimmerman named “the President of the United States, Barack Hussein Obama” as the person most responsible for such treatment. By declaring in the Rose Garden that his son would have looked like Trayvon Martin – the teenager Zimmerman shot during an altercation in February 2012 – the president pitted Americans against each other “solely based on race,” the former neighborhood watchman said. “For him to make incendiary comments as he did and direct the Department of Justice (DoJ) to pursue a baseless prosecution, he by far overstretched, overreached, even broke the law in certain aspects,” Zimmerman said. After a Florida jury acquitted Zimmerman in July 2013, the Department of Justice launched a civil rights investigation against him. “After a thorough and independent investigation into the facts surrounding the shooting, federal investigators determined that there is insufficient evidence to prove beyond a reasonable doubt” that Zimmerman’s conduct violated federal criminal civil rights statutes, the DoJ announced a month ago. 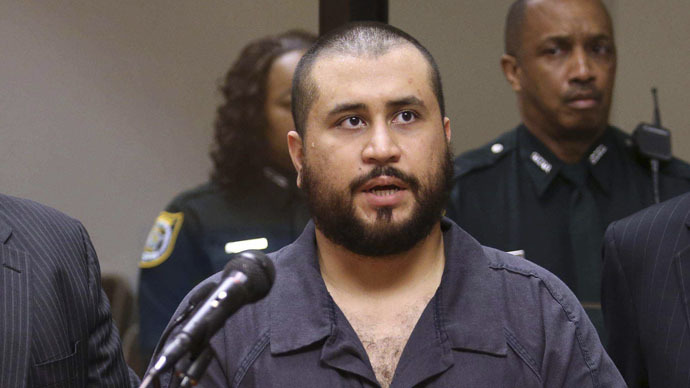 Zimmerman said he could finally speak his mind “without fear of retaliation by the president, the [attorney general], the federal government, etc.,” and claimed the government wanted him prosecuted in order to forestall the possibility of race riots in Sanford, Florida, where the shooting occurred. He also blamed the authorities for ignoring death threats against him and his family. While his Hispanic community in Northern Virginia was extremely supportive, Zimmerman said the Hispanic Caucus in Congress “threw him under the bus.” He also charged the media with having an agenda, painting him as a “white racist” because of his German last name and completely ignoring his Peruvian heritage and upbringing. “Despite it all, I still believe that people are truly good at heart, as Anne Frank has said,” Zimmerman said in the video. “Going back to the actual event, that evening, in Sanford, did you do anything wrong?” his lawyer asked at one point.